Sean Hayes is an American actor, comedian, and producer. He is best known for his role as Jack McFarland on the NBC sitcom Will & Grace, for which he won a Primetime Emmy Award, four SAG Awards, and one American Comedy Award, and earned six Golden Globe nominations. He also runs a television production company called Hazy Mills Productions, which produces shows such as Grimm, Hot in Cleveland, The Soul Man, and Hollywood Game Night. What is Sean Hayes famous for? An American actor, comedian, and producer. His portrayal of Jack McFarland on the NBC sitcom Will & Grace. His film work in movies such as Billy's Hollywood Screen Kiss, Cats & Dogs, Pieces of April, The Cat in the Hat, Win a Date with Tad Hamilton!, The Bucket List, and The Three Stooges. The Will & Grace star has teamed up with The Good Place showrunner for a queer, spy cartoon called Q-Force, and it’s already been given a 10-episode order from Netflix. The project will focus on a “handsome secret agent and his team of fellow LGBTQ superspies” who are “constantly underestimated by their colleagues” and must “prove themselves times and again as they embark on extraordinary professional (and personal) adventures.” Hayes will reportedly voice the lead character, who is being touted as a “gay James Bond”. Gabe Liedman (Brooklyn Nine-Nine, PEN15), will act as showrunner and executive producer alongside Hayes and Schur, as well as Todd Milliner (Grimm) and David Miner (30 Rock, Unbreakable Kimmy Schmidt). “A spy TV series is so tough because they’re so expensive,” said Milliner. “We were thinking how do we get to do gay spy and every week, and the only way to do that is animated because we can do all of the fun parts of a James Bond film. “We can travel, we can have big chase sequences; animation is allowing us that freedom.” Hayes added: “Also, I don’t know that the studios would greenlight a feature with a leading character that’s gay in that genre. Hopefully, they will, but that doesn’t seem like right now. No other cast members have been announced, and the premiere date is yet to be confirmed. Where is Sean Hayes grew up? Hayes was born in Glen Ellyn, Illinois, the USA as Sean Patrick Hayes. His nationality is American and belongs to Irish descent. He was raised as a Roman Catholic in the Chicago suburb of Glen Ellyn, Illinois. Talking about his parents, his father Ronald Hayes is a lithographer and mother Mary Hayes is the director of a non-profit food bank. His father left them when he was five years old, and he and his siblings (Tracey, Michael, Kevin, and Dennis) were raised by their mother. He has not spoken to his father in many years. After graduating from Glenbard West High School, Hayes attended Illinois State University, where he studied piano performance. He left "two or three classes short" of graduation when he became music director at the Pheasant Run Theater in St. Charles, Illinois. When did Sean Hayes pursue an acting career? As a teenager, Hayes was an extra in the film Lucas (1986), which was filmed at his high school. He made his professional debut in the independent film Billy's Hollywood Screen Kiss (1998), which brought him wide attention. The same year, he was cast as Jack McFarland, a flamboyantly gay and frequently unemployed actor, in the NBC comedy series Will & Grace. The show became a long-running hit and Hayes' performance earned him seven consecutive Emmy Award nominations as Outstanding Supporting Actor in a Comedy Series. He won the award for his first nomination. He was also nominated for six Golden Globe Awards for his performance. Hayes also made film appearances in Cats & Dogs (2001), like Jerry Lewis in Martin and Lewis (2002), Wayne in Pieces of April (2003), The Cat in the Hat (2003), and Win a Date With Tad Hamilton! (2004). He was also the voice of Brain in the 2008 film Igor and has guest-starred in television shows such as Scrubs and 30 Rock. In 2005, he was executive producer for Bravo's Situation: Comedy, a reality television series about sitcoms. He also executive produced The Sperm Donor and Stephen's Life, the two winning scripts that were chosen by NBC. He guest-starred in 2006 in the Adult Swim cameo-filled show Tom Goes to the Mayor (S2E15, "Bass Fest"). Hayes appeared as Thomas in the film The Bucket List (2007). On July 5, 2008, he made his New York stage debut as Mr. Applegate / Devil in New York City Center's Encores! production of Damn Yankees. He also appeared as Mr. Hank Hummerfloob and the voice of "The Fish" in The Cat in the Hat. In a 2008 New York Times interview, Hayes talked about a television project, BiCoastal, about "a guy with a wife and kids in California and a boyfriend in New York" for Showtime. He made his Broadway debut in the April 2010 Broadway revival of the musical Promises, Promises. He received a nomination for the Drama League Award for Distinguished Performance and was nominated for a Tony Award for Best Actor in a Musical. Hayes was the host of the 64th Annual Tony Awards on June 13, 2010, on CBS. In 2010, he reprised the role of Mr. Tinkles, the evil white Persian cat, in Cats & Dogs: The Revenge of Kitty Galore. On November 15, 2010, he appeared in a satirical PSA for the repeal of Don't Ask, Don't Tell on The Daily Show with Jon Stewart. He played Larry Fine in the film The Three Stooges (2012). Aware that his role in Will & Grace "wouldn't go on forever," Hayes teamed up with his friend Todd Milliner, whom he met at Illinois State University, to create the television production company Hazy Mills Productions in 2004. The company has produced multiple American television series, including Hot in Cleveland, Grimm, The Soul Man, Hollywood Game Night and Sean Saves the World. Hayes is co-executive producer of the TV Land original comedy series Hot in Cleveland, which premiered in June 2010. He is also a co-executive producer of the NBC series Grimm, as well as creator and executive producer on another NBC series, Hollywood Game Night. Hayes starred in the Broadway play An Act of God, which ran from June 6, 2016, to September 4, 2016. In 2017, Hayes played the role of Steven, the devil emoji in The Emoji Movie. In addition, He and his husband wrote a book named Plum, which is about how the sugar plum fairy got her wings, Sean has always had an interest for the Nutcracker and memorized the whole musical piece. Further, He gets on very well with Ellen DeGeneres and has appeared on her show countless times. Is He Gay, Who is The Husband? 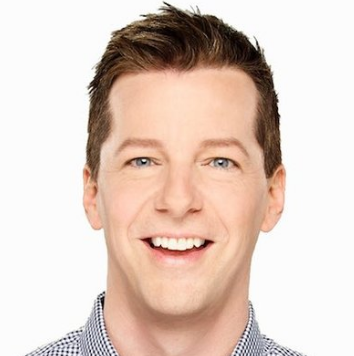 Reflecting his personal life, Sean Hayes was made popular by a gay role and consequently, his sexuality has been one of the major talking points anytime the actor’s name pops up. Hayes’ homosexuality was somewhat of an open secret in Hollywood until 2010 when he hinted for the first time that he is gay. The hint came in an interview with The Advocate. In November 2014 word got out that Sean Hayes had married his partner of 8 years, a certain Scott Icenogle in a private ceremony during the Thanksgiving holiday. Scott is a composer. Hayes has always been gay, since his high school years. He kept it hidden from his brothers and parents until he turned 18 years old. Upon telling his mom, she asked him to go see a therapist as it was not God’s will for his life. Hayes revealed in a 2016 interview with Playbill magazine that he regretted keeping his sexuality a secret from the world for so long. What is the total net worth of Sean Hayes? 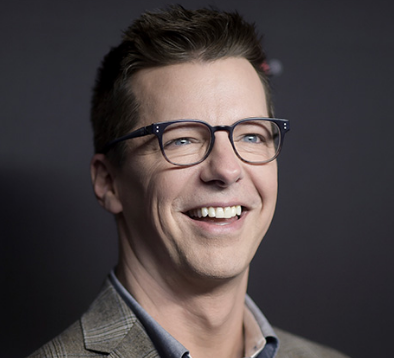 Just like the star actors in ace TV shows like Friends, Modern Family, The Big Bang Theory, etc, Sean Hayes has made the bulk of his TV wealth from Will & Grace. According to some online sources, his estimated net worth said to be $ 18 million dollars at present. However, his exact salary was not disclosed yet. In the case of disclosed, we will let you know. Some of his assets include a 4-bedroom house in Hancock Park, Los Angeles which he bought in 2001 for $1.6 million. Observing his body statistics, He stands a height of 5 feet 11 inches and weighs around 72 Kg. Similarly, He has a pair of blue eyes and dark brown hair color. Further, His shoe size is 12 (US). He won a Primetime Emmy Award, four SAG Awards, and one American Comedy Award, and earned six Golden Globe nominations for his role as Jack McFarland on the NBC sitcom Will & Grace.